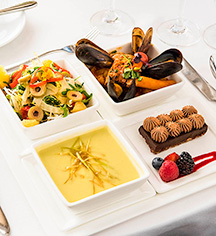 Sofitel Washington DC Lafayette Square offers contemporary, modern cuisine in two restaurant settings, the older of the two being Le Bar; the other is Opaline Bar & Brasserie. Enjoy modernity steeped in tradition with French flair at either of these restaurants featuring local ingredients. Le Bar is a modern bar and lounge for those seeking a less formal environment in which to relax and socialize. 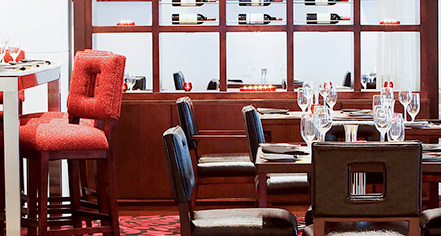 The expansive drink menu features specialty martinis, Champagne, and shimmering wines. For those seeking a bite, small shareable plates are available, with such treats as homemade boudin blanc sausage, charcuterie, and various delicious cheeses. For those seeking an upscale French dining experience, the Sofitel’s answer is Opaline Bar & Brasserie. Named after different types of glass in French, Opaline features a 90-seat bar and 84-seat brasserie, complete with brass fixtures and dark wood flooring in a space accented by blue and gold tones throughout. Traditional French fare like tartines, fruits de mer, croquet monsieur, and steak tartare will make up the delightfully authentic menu.